Look how cute Tibble is. Love the bow on her ear. Thank you so much for this pattern !! It's too cute !! Smooches from Belgium ! 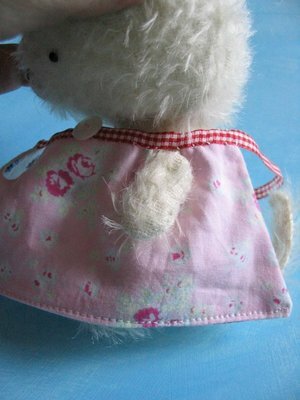 awww, Tibbles is adorable...and thanks for the tute on the reversable dress. I'm not that clever when it comes to sewing. Tibbles is absolutely adorable and so well dressed. A wonderful tutorial again. Thank you so much for this tutorial!! I can't wait to try this! You can't get cuter then this. I always forget to take the HOW TO pictures. These are wonderful. Thanks. Oh my god, Tibbles just made me pass out. So cute! 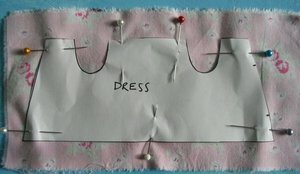 THanks for posting the instructions, my daughter emily is interested in making her own animals and clothes. I think this would be a fun pattern to get her started. What a great idea for making the dress! You are amazing. I can't believe the patience you have! My goodness! I don't know how you do it but everything you post is super cute! You're a very talented artist, and very generous too to share your creations with us. I also believe you should design a book. Have a great weekend, Lyn and thank you for this. 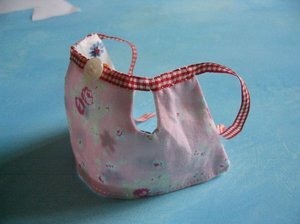 so cute, and so kind of you to share your pattern! Thank you. I never thought about sewing around the pattern--makes sense on such a small piece. Tibbles is wonderful!! Thanks for the dress pattern. It looks like I might even be able to do it. Do you make your own patterns for the "stuff of animals"? They are so cute! Thanks so much for this tutorial. 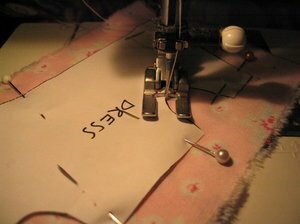 I think it is really wonderful to post helpful information for people who want to get started making stuffed animals and clothes for them, etc. That's the kind of spirit I think crafty blogs should be done in. Tibbles is the best! Thanks for sharing. Your instructions were really simple and tibbles and the dress are gorgeous. Thanks for sharing that pattern - the finished dress looks a lot more complicated that it seems to make. Too cute! As always, thank you very much for the tutorial and pattern. Wow! Thank you for the tutorial! I wish clothes for me would be so easy to make. And Tibbles is so cute! Is she also mohair? 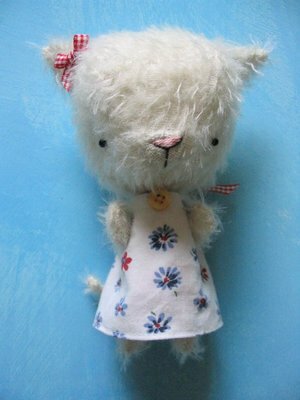 Oh, how sweet is Tibbles and the dress! 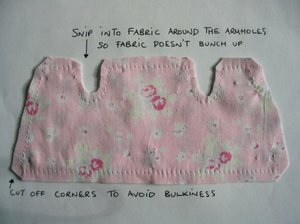 I made my dd a doll for christmas and hated the dress I made....this is a PERFECT solution, and I can make a TON!!!! Thanks! So darling, Lyn! I have two little bears that thought they were boys, but I see now that they are just naked girls! Ooops! Must make some wee dresses for them! Wonderful! 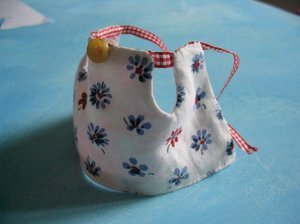 I might try making a larger one for Mia or Esme! How cuuuute is Tibbles and her dress !!!! simple and super cute. thank you, lyn. i just love your tutorials. you're so generous. Very clever! And easy, too. Thanks a bunch! lyn, what can i say...you are very fabulous, love the pattern and am going to go and try it out right now! Okay, I think I'm going to die from the cuteness. A hard call, but maybe my favourite wee creature you've made yet. Thanks for the great how-to! lovely tutorial !!!! 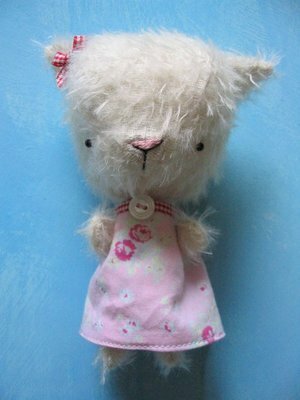 I wonder if i could use the same method to sew a 4 years old dress ...But i have doubts because i'm sure my daughters head is a bit smaller than tibbles :-D ! Thanks for sharing the "How to"! Thankyou for sharing work and the marvelous tutorials. You are a generous soul. Okay Now I know why I waited to finish the doll i'v e been working on si ce mid-november. You hjust solde everything! so so cute! i love it! Tibbles is sooooooooooooooooooooooooooooooooooooooooooooooo cute! nice dress too! Soooooo cute. Please, please, please, have you a pattern for tibbles. I love her. I want her. Thanks for the dress, it's so cute!!! and the model Tibbles is lovely! Cool site. Get yourself a Google Adsense account. You can make extra money out of your web. Je ne comprends rien , mais bravo magnifiques réalisations. wow ! so cute . like Tibble ..